It is a sophisticated, specially secret formulated, room temperature curing, one-part “green” liquid plastic with very unique properties. BULLFROG SNOT was concocted and brewed by a veteran N-scaler specifically to be the ideal solution for improving traction on model railroads, but it can surely apply to numerous other quirky little problems (Monorails, turntables, slot cars, Lego wheels, driveshaft couplings on engines and switch machines, as a DCC insulator, sewing machines, etc.) left to be discovered by your creative fertile imagination. It is easily applied, and easily removed. Just a toothpick is all you'll need to install, an Xacto knife to remove. It's ready to go - no multi-part mixing. No witches brew of acetone, RTV, buffalo glue, snake oil, belt dressing, two-sided tape, shrink tubing, chicken bones, eye of newt, or dilithium crystals. No disassembly, no special tools, no surgical skills. It cures at room temp in moments. No baking. No nasty fumes. It's benign and friendly. Can be thinned with plain 'ol water, if so desired. It's easy to see your work, and it cures to virtually invisible. It is thin - only .0055" or less when cured. It's tough and durable. Has a good service life. Leaves no residue on the track, and no gunk in your engine. Universal - works for any loco from any manufacturer in any scale. Using a toothpick, apply one or two drops to a rotating driver (power the belly-up loco). BULLFROG SNOT forms a thin, very grippy plastic traction tire, virtually invisible after it cures. Thin with water to meet your purpose. Z-scalers like it thin and apply with a fine brush. O-scalers use a trowel (so we've heard). Mix like you would epoxy. The water goes away as the BULLFROG SNOT cures. Apply just enough to evenly cover the surface with a thin coat. Too much makes a mess. Allow the wheels to continue to turn as you watch BULLFROG SNOT cure, let the laws of physics create a nice round tire, until the color is gone - maybe 10 minutes or so. Then let it fully cure overnight, or at least several hours. If you just can't wait for results, some have used a hairdryer to accelerate the out-gassing (curing) process. Which wheels to apply BULLFROG SNOT? Most engines dramatically improve with one axle (two wheels) SNOT'd. Shelf queen steamers come to new life. BULLFROG SNOT improves any engine, even good pullers. Optimum placement and locations vary, so experiment! There is a 'sweet spot' that we must discover, and what doesn't work out is easily undone. You get a perfect traction tire, or tires. Each application will be unique. Share your experiences. But, alas, there will just always be some engines BULLFROG SNOT can't help. What's the big deal about BULLFROG SNOT? Rubber O-ring traction tires rot, wobble, and often fail when there's work to be done, and have been an inherent curse on scale railroading since the early days. They are not replaceable for most practical purposes, and they can't be adapted to slippery engines that were not factory equipped. Unless you are a master mechanical magician. Without traction we have toys, with traction we have a model railroad. SNOT = SAND! Yes, you lose some electrical contact, but most diesels and tender pick-up steamers don't have an issue. If desired, you can trim cured BULLFROG SNOT off the flanges with an Xacto knife for conductivity. Increase the speed and use a 'lathe' action. Be patient. BULLFROG SNOT is a valid trade-off for what little juice pick-up was sacrificed. This is the correct balance of product and application. Yep. Over extended use BULLFROG SNOT will glaze just a bit and the grip diminishes. A brush style wheel cleaner will restore grip, as will a 'burn-out,' spinning the wheels at the start of a running session (particularly if the train area has been below normal room temp). BULLFROG SNOT does not adhere as much as it shrink-fits. For removal, just scribe across the tire with a sharp blade, and peel off with tweezers. Same for any residue you may have spilled on valve gear during installation. What about existing traction tires? BULLFROG SNOT works on both grooved and groove-less wheels. Fill the grooves where tires used to be? Yes! We remove factory rubber tires and go right to the BULLFROG SNOT. Apply in sequential thin layers until you get the desired result. BULLFROG SNOT can be installed over existing traction tires, to improve their grip and to secure them in place. We do not consider this the optimal method. Keep uncured BULLFROG SNOT from freezing and Kryptonite (self explanatory). Subjecting BULLFROG SNOT beyond it's natural Mojavinal temp range prior to comfortable curing messes with it's proprietary pesudoamphibianal ferroequineprimordialpentagonalpolymeric structure. Freeze it and you get a slimy sillyputty slug in a jar. Heating it, well just don't (you don't want to know). Neither does it any good, something in the riviting DNA. BULLFROG SNOT has a 2-5 year (or more) shelf life when properly stored. Some new locos have factory blackened wheels. BULLFROG SNOT does not like to stick to this stuff, so prep the wheels with a bit of emery paper. Scuffed bare metal likes BULLFROG SNOT. It costs too much! $24.95 is too expensive! Ha! Considering the alternatives BULLFROG SNOT is a bargain!! I don't need any darn BULLFROG SNOT, my engines pull just fine without it! OK, if you say so. But we have found that using BULLFROG SNOT on good pullers makes them more 'sure-footed'. Use of BULLFROG SNOT is now a regular part of our maintenance and tune-up process. Why don't engines come from the factory with BULLFROG SNOT traction tires? BULLFROG SNOT is made in the USA. By a Veteran. Patents Pending. 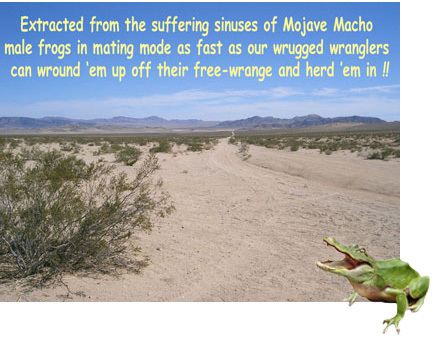 Visit the beautiful BULLFROG SNOT Ranch!! That's about as cheap as it will get. Bullenfroschschnötte and having them shipped together.